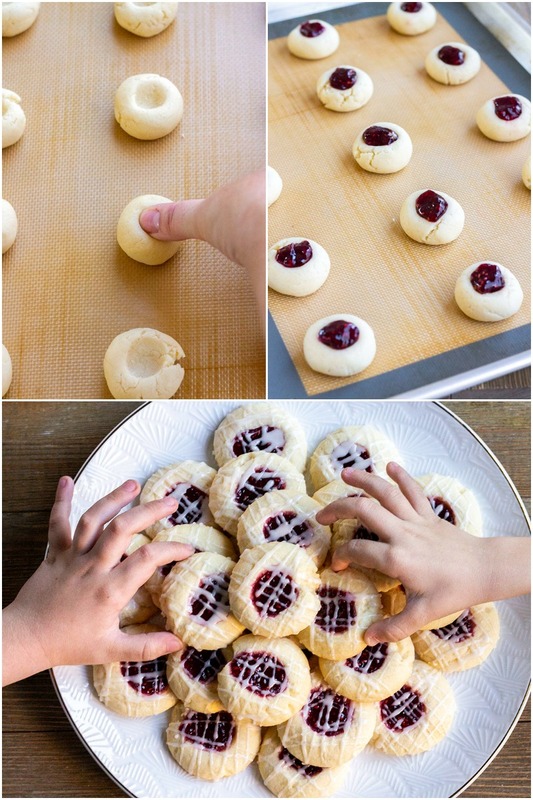 Raspberry Thumbprint Cookies are a fun treat to make with the kids! Buttery cookies with fruity filling and vanilla glaze are dessert lovers dream! Is anyone else craving sweets? I’ve had a serious sweet tooth for the past two weeks. My default is usually chocolate, but today I wanted cookies. 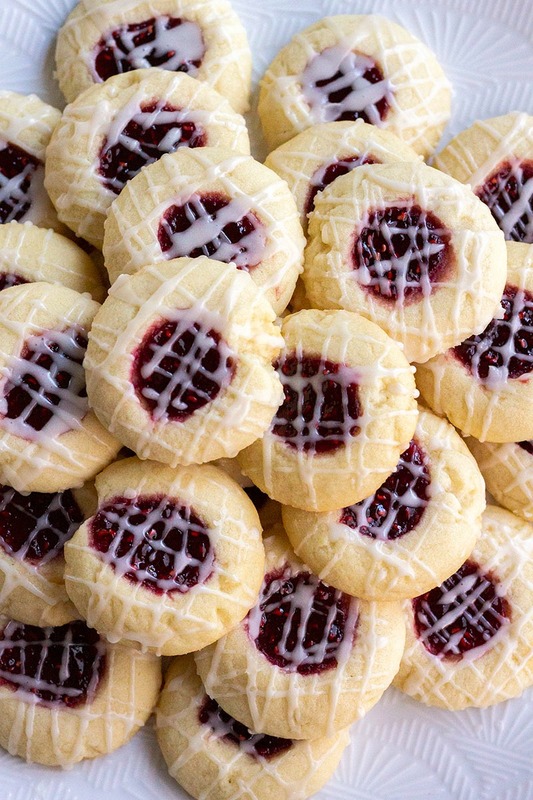 And not just any cookies, but these poppable and tasty Raspberry Thumbprint Cookies. I used to make the best thumbprint cookies with my mom growing up! I would ask for them all the time. So get ready to treat yourself because these cookies just don’t quit. Making food memories with my boys is probably my favorite thing about cooking these days. They’re always asking to help in the kitchen, especially when baked goods are involved. Luckily this raspberry thumbprint cookie recipe is so easy to make they can practically whip them up alone, apart from the whole putting cookie trays in and out of the oven thing. Getting hands-on in the kitchen together is just the best. I love knowing they’re gaining confidence in their abilities and exploring their creativity. 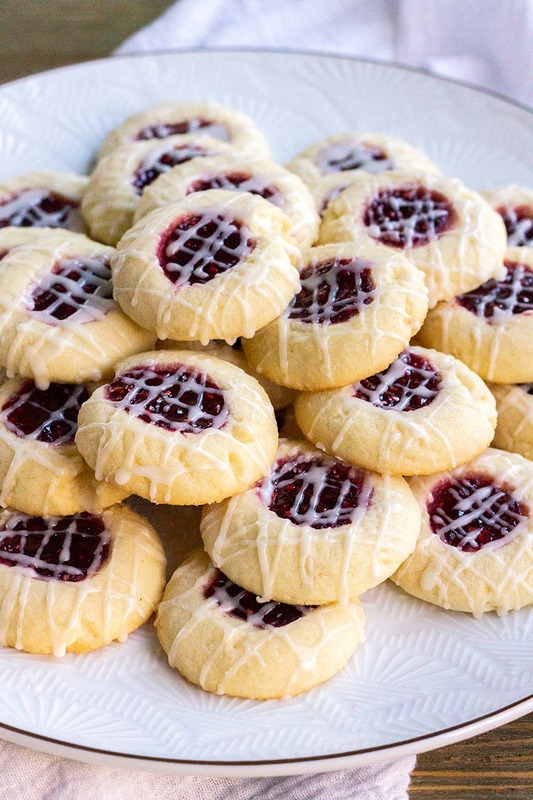 I’m usually partial to grape and strawberry jelly, but we decided to mix things up for summertime and make these thumbprint cookies with raspberry preserves. The tart, sweet raspberries go great with the super buttery cookie base. Then to top it all off we drizzled on some vanilla glaze, totally optional but why not?! The boys could barely wait for the cookies to cool before diving in. We love having these cookies any time of year, but they’re also fantastic for Christmas cookie plates and cookie swaps. Everyone loves a good thumbprint cookie! Preheat oven to 350 degrees F. Line a baking sheet with parchment paper or a silicone mat. Set aside. In a medium mixing bowl, stir together flour, baking powder, and salt. Set aside. In a large mixing bowl (or in your stand mixer), beat together butter and sugar until fluffy, about 1 minute. Add egg and vanilla; mix until combined scraping the sides of the bowl as needed. Add the dry ingredients to the wet ingredients and mix until just combined. Use a small cookie scoop (or 1 tablespoon measuring spoon) to portion the dough onto your prepared baking sheets. Roll the dough into balls. Press your thumb into the center of each ball to create a well. It's okay if the edges crack a little. Bake for 13 to 16 minutes, or until the cookies are set and just beginning to turn golden around the edges. Remove from the oven and cool on the baking sheets for 5 minutes. Transfer to a wire rack to cool completely.